Our press release issued this morning to coincide with the TCD SU hosted husting event in TCD at lunchtime refers to the Stanley Letter of 1831. “They will require that the schools be kept open for a certain number of hours, on four or five days of the week, at the discretion of the Commissioners, for moral and literary education only; and that the remaining one or two days in the week be set apart for giving, separately; such religious education to the children as may be approved by the clergy of their respective persuasions. They will also permit and encourage the clergy to give religious instruction to the children of their respective persuasions, either before or after the ordinary school hours, on the other days of the week”. Article 44.2.4 of our constitution and the present Rules for National Schools #54 and 69 are supposed to give effect to this. There has been much media coverage recently of the scandal of baptismal certificates being used as a religious test for admission of young children into our National Schools. The personal stories from affected families have been published in the national media. We know Nikki Murphy’s (son Ruben), Paddy Monahan’s (son Cormac) and Roopesh Kumar Panicker’s (daughter Eva), and more stories. Although Eva has now been admitted to a National School it is some 6 km away from the family home and being under Roman Catholic patronage there is no separation of the periods of religious instruction and faith-formation from the secular curriculum as required by Rule #54 (The Rules for National Schools, 1965). Suddenly the new Irish like Roopesh Kumar Panicker are asking questions of Irish society it has been happy to brush under the carpet. People have been willing to have a child baptised to get them into certain schools. Suddenly there is a demand to stop these baptisms and find a more equitable way to address education in this country. Of the election manifestos that have been published so far only the AAA/PBP grouping and Renua propose any meaningful reform. Citizens to Separate Church & State (CSCS) and Irish National Schools Trust (INST) have joined forces to seek the following reforms in primary education from the political parties and groupings now that the General Election has been declared for 26 February. The so-called Rules for National Schools are but a travesty of regulations since they were not issued as a Statutory Instrument as required by the Statutory Instrument Act, 1947. They date from 1965 and are no longer available as a printed publication. Furthermore they have been extensively modified by the issuing of Circulars (ministerial Directions). We demand the codification of the Rules as part of this reform and bring them up-to-date with the Circulars that have been issued by successive Ministers. But first of all make the Rules compliant with our constitution and legislation as well as international human rights norms. “Yet it seems implicit in Article 44.2.4° that a school in receipt of public moneys cannot insist on a policy such as admitting only co-religionists as pupils, and the practice of an integrated curriculum would appear to be at variance with this guarantee. This anachronistic and unconstitutional way of delivering education is likely on-course to cost the State €Ms in compensation claims that will arise in the near future when, for instance, some parent of a child in a school or adult, who was schooled in the primary school system, claims that he/she was subject to religious indoctrination in the classroom due to the fact that was impossible for the complainant child to prejudicially not receive the unwelcome material in the classroom. [Constitution Article 44.2.4] Unknown costs may await the State due to this unconstitutional proselytisation and breaches of the UN Convention on the Child. Also if Tusla can’t address the most basic needs of children what will happen if there is a need to pay out compensation? Our solution is for the State to revisit the original National School system (Stanley Letter of 1831) so as to avoid the expense of building new schools to suit every faith/belief system in every corner of the land. The state cannot afford that solution finding it difficult already in providing the funding for a natural population increase in the school-going ages when it is strapped for revenue. Our solution eliminates inequality at a stroke and opens up every type of National School to local children irrespective of their faith or belief. Each one becomes a neighbourhood school as originally intended. This is an exchange in the Dail on 8 March 1978 between Deputy John Horgan (Lab) and then Minister for Education, John Wilson (FF). There is nothing new under the sun in relation to ongoing human rights concerns about Rule 69 application in our National Schools. Boards of Management had been instigated in our schools in 1976. I had been elected to my local board of management and arising from my experience I had formed, with others, the Council for Elected Parents’ Representatives (CEPR) on National School boards of management. In that role I met minister Wilson in 1978 to follow up on Deputy Horgan’s questioning of the minister. Nothing has changed since that time and the present government is just as protective of church interests as every other government since then. Human rights abnegations don’t count despite UNHRC warnings to Ireland that this situation can’t continue to fester. Who is advising the state to tough this one out? Date: 8 March 1978. Oral Answer No. 12. Mr. Horgan: asked the Minister for Education the regulations, if any, that are laid down by his Department to ensure that children attending national school may exercise their constitutional right not to attend denominational religious instruction. These Rules do not discriminate between schools under the management of different religious denominations nor may they be construed so as to affect prejudicially the right of any child to attend a national school without attending religious instruction at that school. (1) The religious denomination of each pupil must be entered in the school register and roll-book. This information should be ascertained from the parent (the father, if possible) or the guardian of the pupil, where necessary. (2) (a) No pupil shall receive, or be present at, any religious instruction of which his parents or guardian disapprove. (b) The periods of formal religious instruction shall be fixed so as to facilitate the withdrawal of pupils to whom paragraph (a) of this section applies. 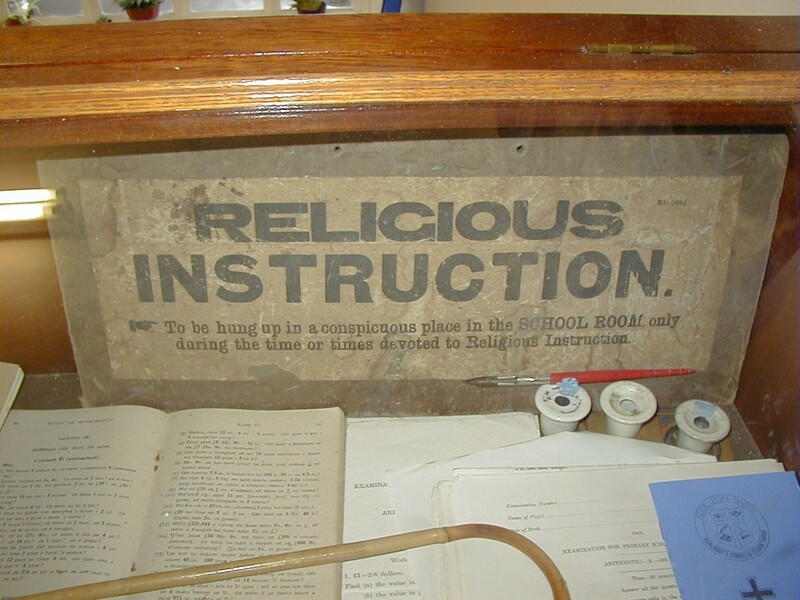 (3) Where such religious instruction as their parents or guardians approve is not provided in the school for any section of the pupils, such pupils must, should their parents or guardians so desire, be allowed to absent themselves from school, at reasonable times, for the purpose of receiving that instruction elsewhere. (4) Visitors may not be present during formal religious instruction unless with the express approval of the manager. (5) The periods of formal religious instruction shall be indicated on the timetable. I presume that the words “management committee” should be substituted for the word “manager” at the end of subparagraph (4) of Rule 69 above. Mr. Horgan: Would the Minister agree that these regulations are not being complied with in the situation in which a child whose parents wish him not to take part in formal instruction is required to remain in the classroom while that religious instruction is taking place? What advice would the Minister give to the parent of a child in such a situation? Mr. Wilson: The board of management in the school has an obligation to see to it that the child is not required to stay there against the wishes of his parents or guardians. Mr. Horgan: If the board of management fail to make appropriate arrangements can the parent or parents in question communicate with the Minister in the matter and will the Minister do something about it? Mr. Wilson: They can and I will.